In was indeed a great feeling to watch the honourable Prime Minister of India speaking about media and its current scenario at the Platinum Jubilee celebration of The Assam Tribune, North East India’s oldest and the most circulated English daily. The motive behind this post is not adjudicate Modi’s speech during the ceremony (which was brilliant) instead capitalize on the fact that his speech has made Assam Tribute treading on internet across India, and this seems to be the perfect opportunity for me to probably express my gratitude to this organization which was established 75 years ago by Radha Govinda Baruah. They say there always has to be an inspiration behind everything you do, and what inspired to probably attempt a career in Journalism is The Assam Tribune. During my school days, though the Cable Television era was well in its full colours, but my access to exclusive News channels was not at all measurable. Fortunately till 2010, I had just two sources of News consumption, Doordarshan and The Assam Tribune. Of the two sources, the later played a key role in developing the taste of news that I have today. Let me describe Assam Tribune; it is one of those old school newspapers that believe in the power of language. It is probably one of the most orthodox newspapers in India, which follows every standard format and guidelines. More importantly, even in today’s age of advertorials, The Assam Tribune still looks and functions like a newspaper. The language used is very formal with no experimentation. English is crude yet impactful. What makes the newspaper further interesting is that it never loops around a topic; the writing approach is very straight and to the point. It also keeps its target audience in mind, with the main newspaper being perfectly balanced for all sections of the society to love it. Supplements on the other hand give a separate treatment to the news and features which keeps the youth and the elitist of the audience glued to the newspaper. The reason why I am such a big patron of the media industry is The Assam Tribune. During my school days in Guwahati, every time I used to pass the yellow building of Assam Tribune in Chandmari, it used to give me thrills. It was only a couple of years later that I realized that it is probably the media industry where I wanted to peruse a career, and here I am today specializing in Journalism. My only contribution to Assam Tribune so far has been only through poems. As a heartbroken teenager when I was sent to Delhi for studies, this 75 year old newspaper was my only platform to get my thoughts published. Hence it’s still my dream to actually write a proper feature for The Assam Tribune. 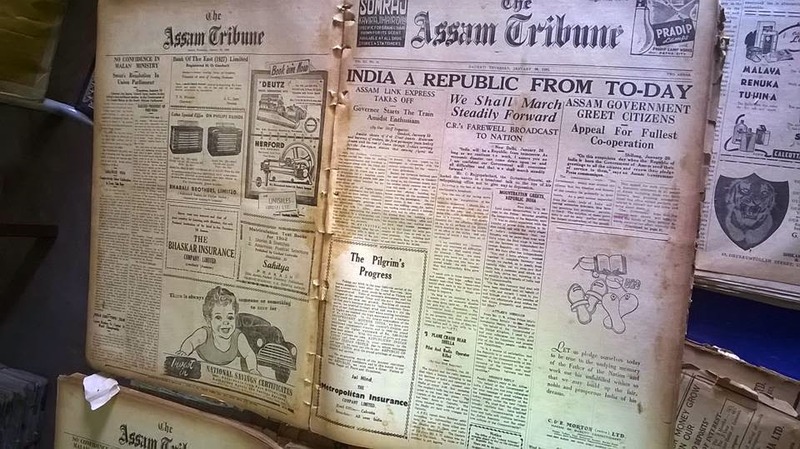 75 years, I would say this is just the beginning, you still have a long way to go The Assam Tribune. At a time when the line between advertisement and news is getting blurred day by day, you still remain an organization which upholds the true journalistic ethics. Thank you for your service The Assam Tribune.